When you hang around Internet strength and conditioning forums like I do, one question eventually comes up. “If you had to pick just one exercise, what would it be?” Why this question repeatedly comes up I am not really sure. For starters I am hard pressed to think of a time or reason that I ever would be limited to just one or even a handful of exercises. Even those of us who have limited access to exercise equipment can conjure up a vast array of options with just a little thought and creativity. Perhaps people are looking for the ultimate in brief workouts and hoping that one or more magic movements exist that will give them all the benefit of a longer program with 1/3 less time and effort (the light beer mentality). Perhaps they are just looking for peer support in hope that others will pick the same exercises that they themselves have deemed “the best”. What ever the real reason this question does come up and once it does…folks begin to chime in. While reading this you may have already consciously or unconsciously started rolling through your own top ten lists in search of the one you would keep above all others. For many it is a squat or deadlift variation. For others it may be the good old burpee. Ultimately, like me, you will probably come to realize that there is no reason to pick just one exercise. There is no single exercise that is the best at accomplishing all things at all times for all people. But…since you asked (or someone did), I will tell you one of my all time favorites. It is called the Clean Deadlift + Shrug. 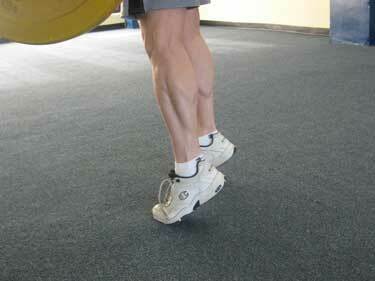 I was introduced to this DL variation when I first met and trained with *Jim Schmitz. Since then it has become a staple in my weight training diet. It is a great total body pulling movement that really works those important posterior chain muscles. It hits just about everything from the neck on down. So remember, there is no reason to pick just one exercise all the time but if you are looking for a great one to experiment with I am sure that once you try the Clean Deadlift + Shrug it will quickly make it’s way to your top ten list. This movement is done with an Olympic barbell but similar versions can be done with dumbbells, cables, Hex-bars or even dedicated DL machines like those made by Hammer Strength or Nautilus. For demonstration purposes I’ll explain the barbell version. All others can be easily figured out from there. In the video I am moving with good control however the speed of execution is a bit fast. To gain the maximum benefit I recommend that you move slower rather then faster with this movement. 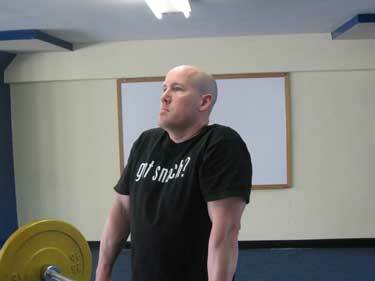 Here’s a closer view of the shoulders and calves to give you a better idea of how the exercise is done. Good luck. Keep training hard!